Entering the Green Zone. 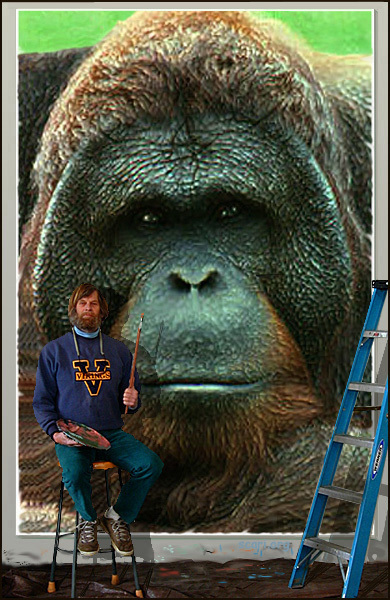 . .
As a painter, I'm slow and methodical so, I didn't think I'd live long enough to be able to paint an Orangutan before they die. I committed to six months of turpentine fumes in close quarters to deliver an image that shows how much I care for all the little animals. 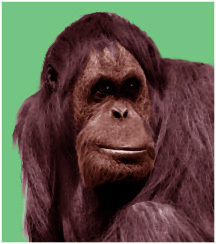 One could consider the canvas a colorfield painting or an objective work that draws on my love of animal art, both abstract and representative, Orangutan is fundamentally an unvarnished and unrestrained use of lots of oil and time. I hope you enjoy the effort to bring attention to the plight of all the primate species including ourselves, Homo Sapian. If we can't perserve the creatures atleast protect Animal Art. Looking to our better angels we have now willingly given up the moral high ground to the primates. While we damn and dike the spillage of entropy our brethren have given up. Intelligent Design allows us, the Homo-Sapien Sapien, the genetic imparative to devolve back to our ancestral origins with no competition from other species. We are now charged with the destiny of Ingelligent Design, fated by the mantle of faith to explore Devolution Theory unfettered by competition. 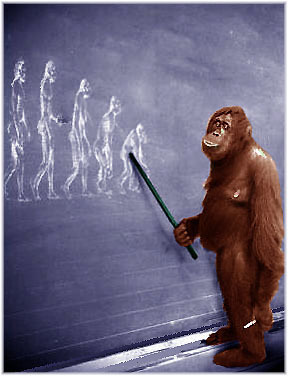 Devolution Lecture on Intelligent Design and reducible complexty given to aspiring students of Devolution Theory. "When discussing art I used to fall into metaphysical banter; a torpor of chaining verbiage claiming to be a priest for the aesthete. Spiritual waxing on aesthetics has become as hackneyed as the art produced, as if abstraction and meditation were signatories of authenticity to indemnify dragging Pretty Things to hang on walls while claiming, 'less is more.' Theory on aesthetic conjecture falls away as I look beyond social acceptance, turpentine fumes, art magazines and market forces to deal with the real." The finished work will be folded into the John and Daryl Lillie collection. The piece, Orangutan will tour with the extended Lillie Collection. The Lillie Collection will be on extented tour on the Eastern Seaborad. Two additional works wiil follow upon completion. My thanks to John Lillie and his lovely wife Daryl for giving me the opportunity to expose the plight of a species so little distanced from ourselves. Our collective interest in Bill and Melinda Gates remains a continuous bond between we of good will. It is hoped their concerns will find fertile soil in which to plant their seeds. With further support from Sir Richard Branson (Making the Skies Green - Enterprise) there is still time to save the planet and have it all. is in the mind anyway. Gutzon didn't know that but the Dakota do." In an interview 3/6/02, When asked of the use of knowledge as power? "The Knowledge is Power Rat Race seems obscured by the statician/analyst -- observers. Information is knowledge? Even rats know, if a little knowledge is a dangerous thing, show me the rat (cat) who has enough to be authentically transcendent." When asked about answers to the question he raises, he said: "Answers, answers -- we have forgotten the question so answers are unobtainable, people realize that unknown knowns are known unknowns that have been forgotten and rest is just skree in a shale slide -- Evangelical Drumming and Creation Care Karaoke is the answer." It's too bad, reality trumps beauty. There were times when, through ignorance or denial, the search for beauty was the supreme goal of seekers of adornment. Self flattery easily falls prey to sentiment. Sentimental artistic expression remains, still, slavish as brokers and clients mutter in corners to form a consensus. Influence by Seekers-of-adornment, of course, skews our cultural fabric, our way of seeing, our way of thinking, our perception of reality.